Financial services giant Morgan Stanley (NYSE: MS) reported better than expected earnings and revenues for the first quarter, despite a year-over-year decline. The negative impact of weak trading activity was partially offset by the stable performance by the wealth management segment. The bank’s stock gained about 3% during Wednesday’s pre-market session, following the announcement. Net earnings of the New York-based company declined to $2.4 billion or $1.39 per share from $2.7 billion or $1.45 per share in the first quarter of 2018 but topped the Street view. The results for the latest quarter included intermittent net discrete tax benefits of $0.06 per share. At $10.3 billion, revenues were down 7% from last year. Revenues, meanwhile, came in above the estimates. Dampening the top-line performance, institutional securities revenue declined 15% to $5.2billion, mainly due to a sharp fall in bond and equity trading. The tough market conditions and lower volumes impacted investment banking also. Meanwhile, Wealth Management revenues moved up slightly to $4.4 billion. At the end of the quarter, book value per share was $42.83, up 9% year-over-year. Return on Equity slipped to 13.1% from 14.9% last year. “We delivered solid earnings despite a slow start to the year following the turbulent markets in the fourth quarter. With an ROE of 13.1% and ROTCE of 14.9%, our results demonstrated the stability and breadth of our global franchise,” said CEO James Gorman. During the quarter, the management repurchased around $1.2 billion shares and announced a quarterly dividend of $0.30 per share, which will be paid on May 15, 2019, to shareholders of record on April 30, 2019. Earlier this week, Citigroup (C) posted an 11% increase in first-quarter earnings to $1.87 per share despite a 2% decrease in revenues. 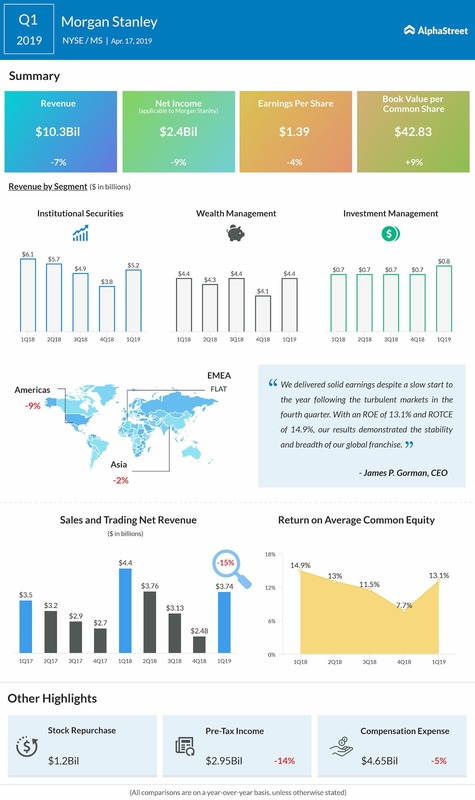 Goldman Sachs (GS) suffered a double-digit contraction in earnings and revenues in the latest quarter as its main business segments witnessed a slump in activity. Morgan Stanley shares surged 16% since the beginning of the year and declined 14% in the past twelve months. The stock gained in the pre-market trading Wednesday following the earnings report, after closing the previous session higher.